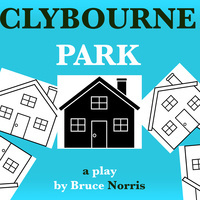 McDaniel College Theatre presents "CLYBOURNE PARK"
McDaniel College Theatre presents Bruce Norris’s darkly funny play, “Clybourne Park,” March 6 through March 9 at 7:30 p.m. in WMC Alumni Hall. The production is directed by Maryland Ensemble Theatre Artistic Director, Tad Janes. Winner of the 2011 Pulitzer Prize and the 2012 Tony Award for Best Play, “Clybourne Park,” explodes in two outrageous acts set fifty years apart. Inspired by Lorraine Hansberry's, “A Raisin in the Sun,” “Clybourne Park” portrays fictional events set before and after the Hansberry play, and is loosely based on historical events that took place in the city of Chicago. Act One is set in 1959, as white community leaders anxiously try to stop the sale of a home to a black family. Act Two is set in the same house in the present day, as the now predominantly African-American neighborhood battles to hold its ground in the face of gentrification. The cast consists of McDaniel students Zack Callis, Karly Congero, Matt Foley, Kiah Hyman, JP Kim, Lauren McKenna, Sam Shoemaker, Kevin Tyson and the ASL coach for the show is Kendall Harnsberger. Tickets are $7 for adults and $5 for seniors, students, military, and the McDaniel College community. For more information, call the box office at 410-857-2448.